Thanks to the HD video accelerator, videos run smooth, including 1080p from Youtube. The overall performance is good, supported by the 2 GB of RAM, and you’ll see pages and apps load up fast. On the downside, the battery drained after 3 hours and 20 minutes and if you’ll run games or videos intensively expect much less. The ExoPC tablet is available for $699. The ExoPC may be the best Intel Atom-powered Windows tablet I’ve tested to date, thanks to its large, high resolution display, accurate touch panel, HD video accelerator, and custom software layer. But text entry is still a bit of a chore, the custom web browser is a bit too basic for my tastes, and the 2-4 second delay when rotating the display is just too long. For $699, I’d kind of hoped for a better experience. Unfortunately, I think it takes a faster processor and possibly an active digitizer to truly get the most out of Windows 7 on a tablet. Both of those things will be available soon from the Asus Eee Slate EP121, but you’ll have to pony up $999 or more for that model. If there’s one thing I’ve learned from testing the ExoPC, Netbook Navigator Nav9, and CTL 2GoPad SL10, it’s that good Windows tablets still don’t come cheap. 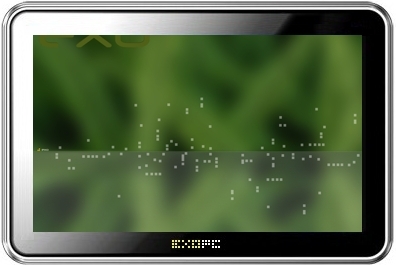 ExoPC: Canadian manufacturer with low global market share, which focusses on tablet pcs.